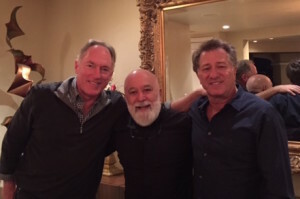 Dr. Jack Dillenberg joins Dr. Reed Day, Jack’s former student at Harvard, and Dr. Bruce Etkin, Jack’s dental school colleague, for dinner at Bruce and Micheline’s home. Dr. Jack Dillenberg’s week began by welcoming ASDOH applicants and conducting a brown bag lunch with ASDOH students. Later in the week, he joined Kevin Earle , Executive Director of the AZ Dental Association, in co-chairing the Arizona Health Improvement Oral Health Work Group meeting at the Arizona Department of Health headquarters. While there, Dr. Jack had the chance to visit with a number of former colleagues from his days as former health director for the state. The following day, Dr. Jack Dillenberg participated as a member of the Southeast Maricopa Regional First Things First Council. He ended his week with his fiancé Jamie, watching snowflakes fall at the Surgeon’s House in Jerome, Ariz.